Donning bikinis is pointless if life as we know it grinds to halt. Why our politicians need to sit down and make some tough choices on climate change. 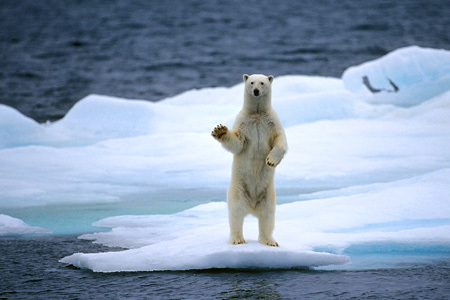 Warming of the oceans - Stranded polar bear on shrinking ice floe. IF WE continue to emit ever-greater quantities of CO2 and other greenhouse gases into the atmosphere, then average global temperatures will rise by 2°C over the next three decades compared to pre-industrial times. Most scientists agree that anything higher is dangerous, though many argue that even this is too much. As the battles to reach an agreement in Paris began, and with so much at stake, it is perhaps curious that few people really understand what a 2°C rise in average temperatures will mean. When our climate changes so much from day to day, an increase of this seemingly small magnitude appears almost trivial. But it is not. Rather than thinking about how much nicer it will be to have summers that are 2°C warmer, we should think about the planet more like we think about our bodies. Like the planet, our bodies are finely tuned biological mechanisms, which need to maintain a careful temperature balance. Our body temperatures only vary from 37°C by around half a degree in an average day. One degree higher is classed as a fever. A couple of degrees up, puts us at risk. A further 1°C rise may not sound much but it actually takes us back 10 million years in global climatic history. A 3°C jump takes us back 40 million years, to a time when there was no ice on earth. Few of us will survive that sort of change. The average temperature of the planet today is around 15°C, one degree more than it was in 1750. A further 1°C rise may not sound much but it actually takes us back 10 million years in global climatic history. A 3°C jump takes us back 40 million years, to a time when there was no ice on earth. Few of us will survive that sort of change. Over the next three decades, if we do not stop polluting the atmosphere at an ever increasing rate, ecosystems will move 60 miles towards the poles, and a 100 yards up hillsides. As many large-scale, terrestrial and marine ecosystems will be unable to adapt, hundreds of species of mammals and birds will die. Due to the rise in CO2 absorption by the seas many shell-forming animals in the oceans will also disappear. The hot spots, where rising temperatures will be most obvious, are Alaska, Canada, Siberia, the Arctic Ocean, and the Antarctic rim. Populated areas will feel the heat too though, notably the central United States, eastern Europe, northern Africa, central Asia, western Australia and the tropical forests around the Amazon river. As the rainforests dry out they will start to decay and this will release more CO2, accelerating the process. In some places the rise in temperatures will be good news – crop yields will improve in high-latitude regions like Scandinavia, Siberia and Canada. In most areas though the changes will not be welcome. Many parts of the world will become too dry, dusty and hot to grow crops or to live in. The availability and quality of water is likely to become a problem too, especially in developing countries. Economically, the increasingly unpredictable weather will slowly reduce our rate of consumption, though this will only encourage conventional economists to demand more growth – and so make the problem worse. Consumption will slow because money will need to be found to build flood defences and protect people from droughts, fires and rising sea levels. These costs will not be met by the private sector, so governments will be forced to raise taxes and so reduce consumer spending. This fading economic performance may not be obvious from national statistics however, because the investments needed to protect and repair the infrastructure will be included in national GDP statistics. In reality though the traditional economy we have today will progressively shrink as we substitute the purchase of cars and computers for concrete (the production of which will also increase the temperature). The warming of the world may also change our values. It may make many people nervous and uncertain, less trustful of politicians and more fearful about the future. With rising food prices because of unpredictable harvests and higher taxes, it may make most people poorer. It is in our nature perhaps to want short-term fixes to our problems and most people will find it hard to accept there are none. So there is a risk that people will get angry too. This will not help much, as even if we stopped pumping CO2 into the atmosphere tomorrow, the effect of what we have already emitted will last for years to come and the chain reaction we have started will continue. No matter what we now do, the climate experienced by our grandchildren will be like nothing we have experienced before. The good news is that we can still avoid the worst, at least technically. We can shift to a non-carbon world and we can avoid the 2°C limit, though time is very short and the steps required are difficult to implement. This is because the solutions, though not very expensive in global GDP terms, require huge changes in a short time and in several systems. For instance, we will need to free ourselves from fossil fuels, stop deforesting and bring about major reforms in our agricultural production. So our future depends on our politicians making the right choices, to do something because it is necessary not because it is easy. And it is up to us to replace them if they fail. The developed countries need to subsidize the opportunity cost of poorer nations that are being urged to refrain from using cheaper sources of power for their industrial growth. Without this growth they will always remain poor and their political systems will be under great stress. Excellent concise article. We're talking two degrees here but it's 180 degrees of separation between world leaders at the Paris climate talks. The perception gap between the rich nations and the developing world needs to be closed. It is absolutely true the so-called 'first' world created an enormous amount of muck in the process of acquiring a tony 'developed country' cachet.